While tattoos provide a great way for people to express themselves and decorate their bodies, some people can end up regretting a tattoo months or years down the track. If you’re looking to remove a tattoo due to regret or other reasons, Skiin can provide assistance. We offer safe and effective tattoo removal in Melbourne that doesn’t involve the use of lasers, meaning it’s capable of targeting and removing all tattoo ink colours. 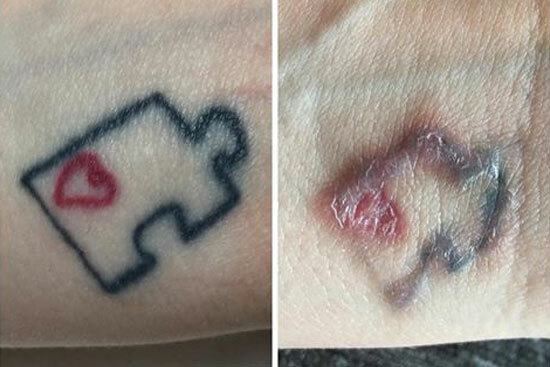 How Does Our Tattoo Removal Work? For our tattoo removal in Melbourne, we use an innovative skin needling pen to inject a tattoo removal solution below the surface of the skin. This solution contains a lactic acid compound that causes the ink to rise to the surface of the skin and form a scab. When the scab falls off, rejuvenated, tattoo-free skin is revealed. As the procedure uses a chemical removal process instead of laser, all tattoo ink colours can be safely targeted. If you’re seeking tattoo removal in Melbourne, contact Skiin today to learn more or book an initial consultation. We’re happy to answer any questions you might have about the procedure and inform you of your suitability. * Disclaimer: The content of the SKIIN Clinic web site, such as text, graphics, images, and information obtained from third parties, are for informational purposes only. Results from series of treatments performed may vary from a person to another. It is recommended to consult our qualified doctors, nurses or skin therapist prior to performing a treatment.